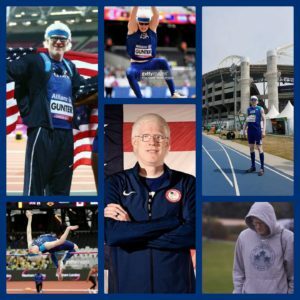 Tyson Gunter is an elite para track and field athlete from McCammon, Idaho. Born with albinism and legal blindness, Tyson had a lot to learn and overcome. Although considered legally blind, he still has 10% to 15% of the vision of the average person. The lack of pigment in the skin also causes easy sunburns and light sensitivity in the eyes. His disability never stopped him from trying new things. Being the youngest of seven, he always wanted to be like his older siblings and play sports. From a young age Tyson played every sport he could, with the goal of being a professional athlete someday. As time went on he dropped sports he couldn’t be competitive in and excelled in the ones he could. Track and field quickly became a perfect fit. After a 2 year church mission, Tyson earned a track scholarship to Idaho State University where he scored points at the Big Sky Championships every year. Shortly after graduating ISU with a marketing degree. Tyson was introduced to the US Paralympic program. Since starting, Tyson has won 2 world championship silver medals, and was on the 2016 US Paralympic team in Rio. Most importantly he reached his goal of becoming a professional athlete, although it was not how he had expected. Over the years Tyson has had a lot of support from family, friends, and coaches. It takes a lot more support than a person without a disability. He is married to MaKenzie Gunter and lives in Spanish Fork, Utah managing a sports training center called Athlete Development Center. Growing up on a dairy farm taught him hard work and to love being outside. Tyson‘s other hobbies include coaching, attending sporting events, outdoor recreation, entrepreneurship, and snowmobiling.